Summer holidays in our childhood meant visits to our grand parents’. For two months every year, we would be off to Tirthahalli and Brahmavar, small towns in southern Karnataka, where we would enjoy the atmosphere with all our relatives. More about those summer escapades in some other post. This story is on a different topic. Dad would be offered one all expenses paid trip to any destination every two years by the bank he used to work for. One summer he decided to take us on a trip to the South Indian city of Mysore. Mysore lies close to Bangalore and is about a 3-4 hour journey. We had relatives in Mysore at that time and went to stay with them. Mysore is famous for its dassara festival usually held in the month of October. Now this was a summer trip so we did not get to see the festivities. However there are quite a few other attractions in this once lovely city – almost a hill town those days (early-mid 1980’s). There are the Brindavan gardens, Gopalaswamy betta and Chamundi Betta , the mysore palace and other nearby tourist attractions. During our stay there we visited the Chamundi Betta (Betta is the Kannada word for Hill/hills). This is a temple shrine for the hindu goddess Chamundi (an avatar of Kali) and is located on top of a hill named after this deity. There is a huge figure of Mahishasura at the entrance, if I recall correctly (20 years of data to recall). Now, where there is a temple, this being true of most shrines in India, there are monkeys. The Chamundi hills were no exceptions. We were advised to keep all loose belongings and eatables inside bags/pockets and proceed to the temple. Kids were to be held close by so that the monkeys would leave us in peace. 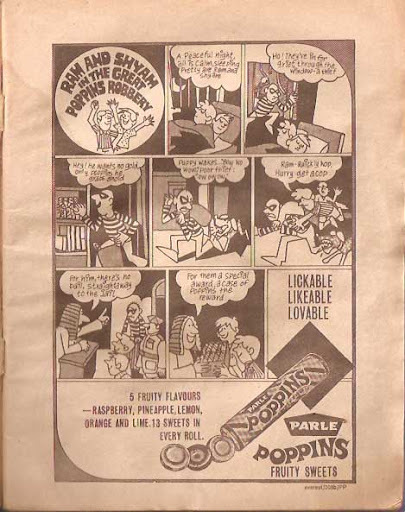 Parle Poppins were a favourite for kids those days. The circular candies were a hit with both parents and children. With parents because they were cheap and affordable and with children because they cam in so many flavours. After our visit to the temple and while returning back down the hill, my sister without us knowing, took out her pack of Poppins and proceeded to eat one. No sooner was the pack out a monkey grabbed it and made haste and my stunned sister – she must have been around 4 years of age then- started bawling and wanted the pack back. No amount of consoling would calm her down. An offer was made to buy her a new pack when we descended down the hill… but still there was no sign of her calming down. Finally I offered my pack and seeing that I wouldn’t have one if she took it, she grabbed it and stopped crying. For a considerable period of time after that, whenever she had something I wanted and needed urgently, a gentle reminder of what happened at Chamundi Betta and things got better !